If the iPad wants be taken seriously as a business tool, it’s going to need an office suite. So far, the best examples of same are Apple’s own iWork apps—Pages, Numbers, and Keynote ($9.99 each). How much work can they really do? Here’s a first look. While the three apps are sold separately, they share a common look-and-feel. When you launch each app for the first time, you’ll be welcomed by a “Get Started” guide in that app’s native format (a document in Pages, a tabbed worksheet in Numbers, and a presentation in Keynote). Take a couple of minutes to run through them; they’re good, quick introductions. That done, tap the button in the upper left corner. It’s called My Documents in Pages, My Spreadsheets in Numbers, and My Presentations in Keynote. In any app, that will summon the Document Manager screen. There you’ll see all of that app’s document files on your iPad, in a nice, side-scrollable thumbnail view. After you choose a template, you’ll finally get to the app’s editing screen. There’s a toolbar running across the top of that screen. While some of the details change from app to app, the basic layout of it remain the same. In the upper left, there’s that My Documents button again, which will take you back to the Document Manager. Next to that is Undo. On the right side, you’ll see four icons (five in Keynote). Those are the common elements in each iWork iPad app. After that, they start to differentiate. Working in Pages on an iPad isn’t all that different from working in a desktop word processor: You start with a blank sheet, you type in some text, then you embellish it with typography and graphics. The difference is that your tools for doing all that on the iPad are curtailed. 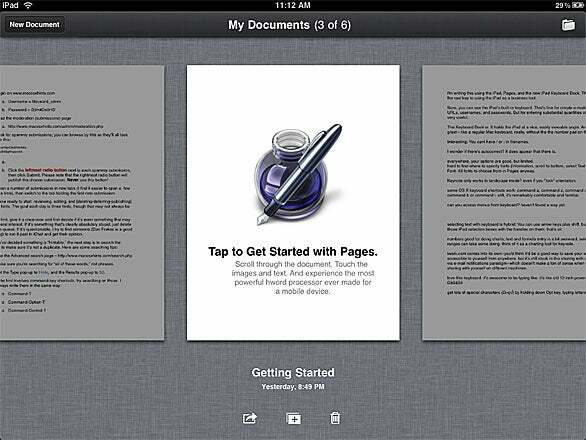 Pages’ editing screen changes depending on the iPad’s orientation. In landscape mode, you see just a blank document and the iPad’s virtual keyboard. If the iPad is turned to portrait mode, you’ll see a toolbar at the top and the smaller version of the keyboard below. That makes some sense: Landscape mode is just for typing, so you want that bigger keyboard; when it comes to styling what you’ve written, you (most likely) want to see it in portrait mode, the way it will print, so that’s where you get the page layout tools. 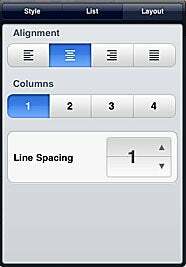 In Pages, the toolbar’s Info button enables you to apply text styles (there are 13 to choose from), format selected text as a list, select the alignment, configure columns, and specify line-spacing. If you scroll down to the bottom of that style list, you can also open a Text Options screen, where you can choose from one of 43 fonts and set the size and color of the type. On the Tools menu, in addition to the four standard options (search, help, etc. ), Pages also gives you a Document Setup option; tap on that and you get a screen where you can apply document-wide layout settings. Many of these same options are replicated in a formatting toolbar below that standard one. It has a drop-down style menu and buttons for character styles (bold, italic, underline) and paragraph alignment. The only unique setting here is a button that lets you insert tabs or line, page and column breaks. Below all that, there’s a ruler you can use to set margins and indentation. You get more editing tools by selecting and tapping on words. 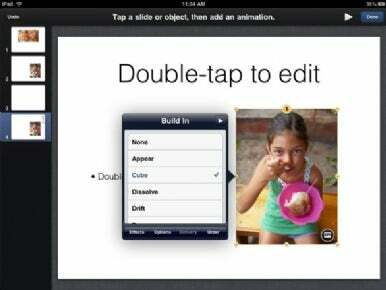 The iPad uses many of the same selection standards as the iPhone: Tapping twice on a word selects it; a pop-up menu enables you to cut, copy, or replace the word with one that’s spelled similarly; paste previously copied text; or look up the word’s definition. Tapping three times on a word selects the whole paragraph, with similar options. No matter how much you select by tapping, you can select more or less using the drag handles in the corners of the selection box. A magnifying glass window appears above the text as you drag the handles, showing you where the selection point is. If you touch and hold on the right side of the Pages screen, the Navigator appears; it lets you navigate through pages in your document quickly, showing page numbers and previews as you go. While Pages has many of the most essential word processing tools, it obviously doesn’t have them all. Its spelling tools are comparatively limited. If you misspell a word, it’ll underline it in red; tap on an underlined word and Pages will suggest some alternatives. But it doesn’t have the same extensive proofreading tools as the desktop version. You can’t add complex document elements, such as tables of contents or footnotes. And It offers fewer fonts and styles than the desktop version. But it otherwise has many of the features you’d want for everyday, basic documents. Numbers' interface is almost identical with Pages', with a few tweaks. That Info button, for example, gives you spreadsheet-specific options. Tap on it after selecting a cell and you’ll see tabs where you can specify fills, borders, text styling, header rows and columns, and data formats (number, currency, date, etc.) Select a chart, and that same menu lets you pick the type of chart and format your data axes. In the workspace itself, you’ll see a blank spreadsheet. There are tabs at the top, so you can add multiple worksheets. Tap once on a cell to select it, with those draggable handles to extend your selection. Double-tap on a cell and a data entry screen rises up from the bottom, with tools to add numbers, times and dates, text, and formulas. There are plenty of built-in functions (more than 250) to plug into the latter. Tapping once on a chart selects it for formatting; double-tapping on it lets you specify the source data. Doing that is simple: You tap once on a cell in the data range, then use the data handles to select the entire range. Keynote for the iPad has more of its own quirks than the other two apps. It’s also, to my eye, the app that’s best suited to the tablet. The one quirk you’ll notice immediately: Keynote works in landscape mode only. The presumption (logical enough) is that presentation slides are in landscape mode. The wider aspect ratio also provides room at the side for scrollable thumbnails of the slides in a presentation. Within that sidebar, you can arrange the order of slides by tapping and holding the one you want to move, then dragging it wherever you want. Tap on the plus-sign at the bottom of that sidebar, and a sheet pops up with several sample slide layouts (prepopulated with dummy text and graphics) in your chosen template. Over in the editing screen to the right, you’ll see three of the usual four buttons (Info, Insert, and Tools), which do pretty much the same things they do in Pages and Numbers. But there are two new ones: Animation and Play. If you select an object and tap on Animation, you can select and customize build-in and build-out animations; there are 13 choices, from Appear and Cube to Swoosh and Twirl. You can specify the timing, direction, and order in which those animations occur. You can also tap on any object on a slide to select it, then move it around with your finger. With two fingers, you can change its orientation or size. Of course, the Keynote iPad app doesn’t have all the tools of a full-fledged desktop program. You can’t implement animations based on user input, for example, or print out speakers notes. But because presentations are inherently graphical, with relatively simple text input, and because the iPad itself would make an excellent machine for delivering presentations (you can use its video-out port to run presentations on an external display), Keynote is probably the iWork app that works best on the tablet. The iWork apps for the iPad probably deliver 80 percent of the functionality that the average user will need, and do so in way that’s easy to pick up quickly. But there’s one area in which they’ll likely frustrate long-time Mac users. The biggest difference between the iWork iPad apps and regular desktop programs is the way they manage files. With desktop apps, we use a Finder-based interface to locate and manage their files. There’s no such universal interface on the iPad. Instead, each iWork app has its own Document Manager where you can select, duplicate, and delete files. That’s OK when it comes to working with files on the iPad. But it becomes confusing and clunky when it comes to moving files on and off of the tablet. You can’t just select some files on your Mac or your iPad and drag them to the other machine. Instead, you have to use iTunes and each app’s Document Manager to copy files to and fro. More specifically, you need to use File Sharing in iTunes 9.1. You select the Apps tab in iTunes and scroll down to the new File Sharing section. There, you’ll see a list of the iPad apps that support file-sharing. Select one of those apps, and you’ll see a list of its files on your iPad. To copy files from your Mac to the tablet, you can drag them from the Finder into that File Sharing pane, then do a sync. To access those new files on your iPad, you open the app’s Document Manager, then tap on the Import button at the upper right. Keynote can import .keynote, .ppt, .pptx, .pps, and .ppsx files. Pages can do .pages, .docx, .doc, .dotx, and .dot formats. And Numbers can work with .numbers, .xls, .xlsx, .xlt, .xltx, .xlsm, .xla, .csv, and .txt. Some document elements may be lost in translation. For example, if you import a Keynote presentation from your Mac to your iPad, it’ll lose any recorded or embedded audio, object groups, presenter notes, and 3D charts. If the iPad app doesn’t have one of the fonts used in the original, it’ll substitute it with one that matches it closely; if a match is not found, it’ll use Helvetica. When you first open the imported document, the app will show you a list of the changes. When you want to copy a file from your iPad app to your Mac, you open up the app, select the document in Document Manager and hit the Export button. Then you can select the file-format in which you want to copy the file. All the iWork apps will, of course, export in their respective iWork ‘09 for Mac formats. They can also export to PDF; Pages can also save in the Microsoft Word (.doc) format. 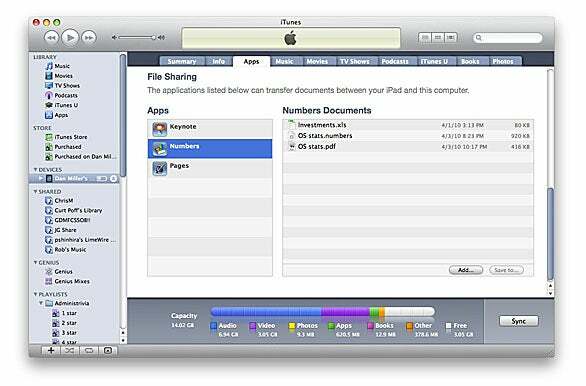 The next time you sync, you select the app in the File Sharing section of the iTunes’ Apps tab, and either drag-and-drop files from there to your Mac or select the file and click the Save To button. You can also use that Export button to send iWork documents via Mail or to share them via iWork.com. Quite frankly, this system is a hassle. We’re used to dealing with documents as files that we can manage outside their associated applications. Using individual Document Managers and iTunes is a lot of hoops to jump through. If nothing else, it’d be nice to have a Files tab in iTunes, where you could manage all your iPad’s data files. Or, as others have suggested, iDisk, iWork.com (as a save destination and not merely a file-sharing site), or Dropbox could also solve the problem. For now, file management is the biggest weakness in Apple’s iWork apps. Otherwise, they—and particularly Keynote—look like nicely capable mobile apps that fall somewhere short of their full-fledged desktop counterparts. The iPad as business machine? These iWork apps make it plausible.